← NEW YEAR, New Challenges, Continuing the great work! I’m Leslie Maniotes- co-creator and author of the Guided Inquiry Design process and book series, leader of this blog. I’m taking the blog, for one post, to welcome this new year, set the vision for this work and inspire engagement. Get a cup of tea or your favorite beverage, I’m here to tell you a story. I made this post a pretty hyperconnected document so you can dig in more deeply to the details of my story, if you are so moved. Enjoy! Having graduated high school in the Stop Making Sense era – he was an icon we all recognized. We all shouted “Hey David!” To which he turned, smiled, and gave us a big wave as he bumped down the curb. This was back in 2004 and David was beginning his quest starting with riding bikes in the cities he was visiting. Turns out, he loved the experience as it gave him a new perspective on the cities and so he got involved in the bike sharing movement. Well, 14 years later, David is telling a larger story with his new record album which he says is about looking and asking . (Fitting for Guided Inquiry, right?) And, he is finding new channels to tell this story about Reasons to Be Cheerful. They were proven to be successful by the people themselves. It’s pretty inspiring to hear about ordinary people becoming more engaged in their communities through libraries, community events, and organizing. There’s great possibility in when a group of people believe in something- they declare “THIS IS IT! !” and spread that feeling by taking action and replicating the results in their own contexts. 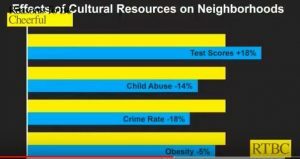 A little sidebar- in his talk at the New School he showed this graphic (at about minute 34) of a UPenn study in New York neighborhoods. It showed how cultural resources, libraries and community arts centers, postively impacted the people who live in those communities. Byrne mentioned this and then said all things are connected. Things that you think might not be connected, actually are. He specifically named that child abuse, obesity, crime went down, while student test scores in schools rose 18% in these vibrant communities with rich cultural resources. So, you may be wondering why I’m mentioning this here. Well, this blog is our community of practice! You have decided that Guided Inquiry is IT! It has helped you reach students in new ways, teach the way “you’ve always wanted to teach”, engage students, lead others, and be a better professional! This blog is how we share that practice. This blog serves as a space that is changing the narrative of what is happening in education. Through your stories, as we raise our voices together, we are sharing many things to be cheerful about in education. Many people don’t know about Guided Inquiry, but through your stories, people are learning that schools can include more voice and choice. Students can create inspiring and creative works to share their knowledge and understandings with others, and that through inquiry, our students learn to be connected to their world in ways before unimaginable. With that, won’t you please join me for another year of cheer, of leadership, and of reflection where educators across the globe are inspired by the possibility of Guided Inquiry Design, where others might come and replicate your ideas, to make their community and schools more vibrant with questions and student voice in learning, like yours. Here’s to another great year! We can’t wait for you to tell your story. Thanks for being a part of it. On January 21st, we welcome Teresa Diaz who will kick off the new year. She is new to the blog, a middle school librarian from San Antonio, Texas. She will share her learning about using the QFT within the framework of GID. Stay tuned folks! And sign up , if you haven’t already!